A greater way to hold elected at all levels more accountable. A better way to see that local and national issues are addressed. Rome for improvement is not an under exaggeration that's needed. Long unaddressed, UnitedPeople is tackling vital issues. Before Facebook etc, was exposed for data breeches, UnitedPeople was calling for better data protections. TD's lying on the matter. All avoid mentioning of abuses. TD's not willing to tell the public the full truth about a state setup. Exposing the quiet underhand agenda of other parties, who undemocratic have decided to give away people's services. Some issues to be resolved and improved, are not about right or left-wings agenda, it's just about doing the right thing regardless of political party ideology. Irish govt... grow up! Look back at Brehon laws and learn. Look at Finland, Iceland, the Netherlands, etc... Look and learn. I wish for a republic that our forefathers truly intended. One where our government serve the citizens, where the welfare of us all are the priority and not corporations and' the market' a country is its people. Put an end to homelessness, poverty, hospital waiting lists and trolley abuse of our sick and elderly. Time to start caring again about each other. Let the people decide for themselves. No longer should Ireland's people be treated like children. "Ireland unfree shall never be at peace." Padraig Pearse. The Irish government are corrupt greedy and lack all morals. FG are for the rich and always were. They despise the ordinary working man and the poor. Hence Jobbridge and JobPath. Without true accountability we are banging out heads against a brick wall, the system is infected and that infection needs to be cut out, we have to work together to make it happen. A government for the people by the people. Not what we have now! I want an end to injustice and inequality. A tall order me thinks! Bunreacht Na Eireann of 1937 - is it really standing the test of time? A document 81 years old poverty, evictions, pillaging of our natural resources, austerity polices, fundamental rights ignored. Too much power yielded to government. The people of our great nation need to change it. The above and more, being addressed by UnitedPeople. 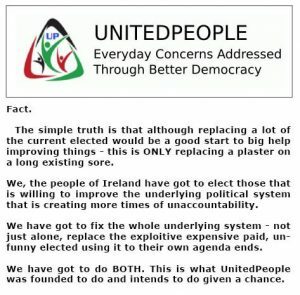 UnitedPeople is what the name says, a party of people from all aspects of Irish society, united in determination to not only resolve issues but further improve them. Speak UP! More topics being looked at by UnitedPeople, can be found under the top menu. Do check it out. Address: 31 Bieulieu View, Drogheda, Co Louth. Eire. UnitedPeople is made of of citizens from every corner of every county. It's your party and a fresh opportunity to make a real difference. Help us to put the country forward in better progress.